Apsara Angkor Resort and Conference built in the styles of the Khmer and Colonial Architecture and decorated like the home of Khmers, it offer a unique charm of bygone Angkorian era, and complemented with the conveniences of today’s luxury that has all the comforts of a home away form home. 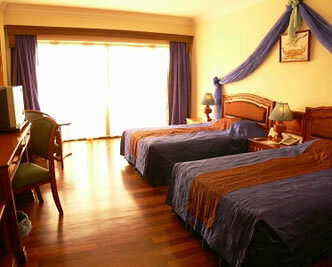 The hotel blends a traditional ambiance of the old-world elegance and modern convenience. As guests enter the lobby, they are reminded of the charm of the Khmer arts and civilization. It features an unusual traditional designed chandelier and marvelous artworks by original Khmer masters to make any stay at the hotel truly memorable of the past romance. Apsara Angkor Hotel in larger map.